Unwind in the comfort of our rooms after a busy day. 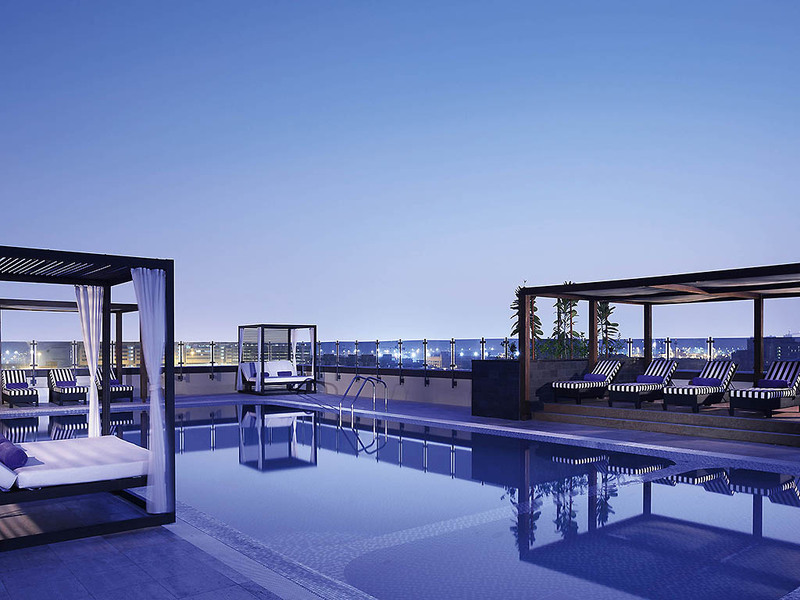 Stay connected with free WIFI or choose to take a dip in our rooftop pool overlooking the Dubai Creek. You can always opt for a shopping spree in the adjacent Dubai Deira City Centre. A city of exponential growth, Dubai - with its iconic skyscrapers and high-rise buildings - is one of the most visited places in the world. Pullman Dubai Creek City Centre stands watch over the historic Dubai Creek and the rolling green fairways of Dubai Golf and Yacht Club. Its superb location close to the Dubai International Airport and City Centre Deira shopping mall lets guests capture the essence of the city, which is just one of this luxury 5-star hotel's many assets. Discover an interactive dining experience with live cooking stations featuring international cuisine and amazing Chef's table . Dive into the finest seafood night every Thursday and get ready for a culinary trip around the world in our Friday Brunch. 'The t-Lounge by Dilmah' is located at the hotel lobby in partnership with Dilmah Tea, one of the finest tea companies in the world, serving hand-picked premium Ceylon Tea. Indulge in an unforgettable high-end tea experience! Lounge in leisure at this rooftop pool lounge while sipping cocktails and be amazed with the stunning views of the Old Dubai skyline. Catch up with friends at this plush and stylish bar while enjoying good food, lively atmosphere, a wide range of beverage to choose from and the latest sports excitement. An added privilege for our Executive Level Guests, the Executive Lounge offers complimentary breakfast, afternoon tea, pre-dinner drinks, snacks, and private work stations within a contemporary, cozy environment. No access to children under 12. 서비스, 청결도, 음식맛, 편의성, 접근성, 가격 모두 좋았습니다. 일단 위치가 매우 좋았다. 쇼핑몰과 연결되어있어서 필요한 모든것이 다 있었다. 특히 그럼에도 공항에서 멀지 않아서 더욱 메리트가 있었다. 다음에 두바이 여행시에 또 투숙할 예정이다. 공항에서 가깝고, 시티센터쇼핑몰과 호텔2층에서 바로 연결되며, 지하철까지도 쇼핑몰을 통해 갈 수 있어, 위치적으로 최고입니다. 직원들도 매우 친절했으며, 방도 깨끗하고, 조식도 깔끔해서 모든 가족이 다 만족했습니다. 쇼핑물이 연결 되어 있어서 편리하고 교통도 이용하기 편해서 이호텔을 자주 찿게된다 ..
호텔앞 주차장에 주차하였는데 체크 아웃 후 영수증 미발급으로 150 AED 벌금을 물었음. check in / check out 시 안내를 받지 못하였음.